1. Heat the juice, sugar and the lemon zest and juice together, stirring occasionally to help the sugar dissolve. 2. Take this off the heat, let it cool down and add the cider and Calvados or brandy. Refrigerate until cold, then pour into a shallow metal dish which will fit in your freezer (I usually use a small roasting tin). 3. Freeze, then after a couple of hours scrape the crystals setting around the edges with a fork. 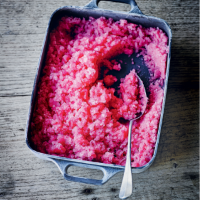 Do this at intervals until the granita is frozen. You want to end up with glassy shards of ice. 4. If the mixture sets hard, just leave it out for about 4 minutes at room temperature, then fork it again before serving.